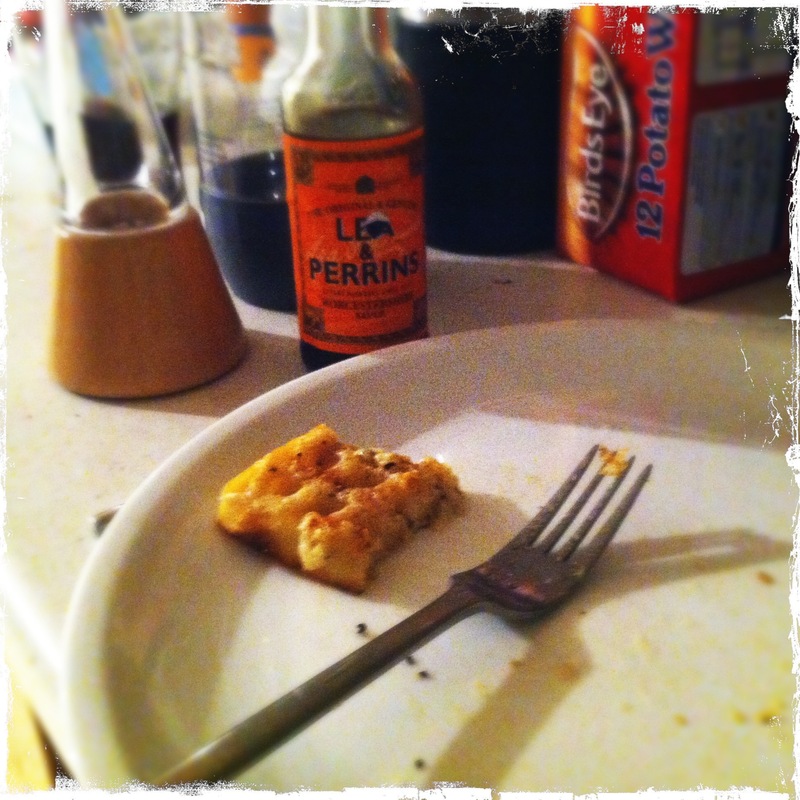 The Spyglass Review, a lot of cider and drunken cheesy waffles! Well it’s Monday and I’m sitting here looking out of my window into a very rainy Bath reflecting on my weekend and what to write for my second restaurant review. It was my bothers birthday so we met up in Bristol and went to a place called The Apple, which as you can imagine has a lot of cider. It is a converted boat and a really nice place to have a drink with a top covered deck and a downstairs with comfy sofa’s. Now unfortunately due to teenage years of cider abuse I can’t even small the stuff anymore so I had to have beer. Everyone else had Cider and they had to get the Corona from a special place downstairs. I can imagine them going down and blowing dust of a crate of hardly used corona and saying in thickest Bristolian (think west country accent with a hint of Pirate, yaar!) “There’s one of them fancy beer drinkers upstairs!”. So we stay here for a few drinks which was very nice, even having pork scratchings. Not had these for years and they are still as good as ever. Still likely to cause a major heart attack but so good! There was talk of me doing a pork scratching special on my blog but I’d fear for my health if I had to try all the different varieties. After a couple of drinks we went to a place next door called Spyglass. Again it’s a converted boat with half of it on land then going into a boat moored next to it. Pretty cool place. The menu was very simple but still quite hard to choose something. A few of my brothers mates had been here before so I had a few recommendations. First things first…the wine. The guy recommended a nice Sicilian red which was very drinkable. Although I foolishly went with a whole bottle and needed help about half way through dinner from the cider drinkers! I had some sweetcorn fritters to start which we’re really nice. It was a mixture of sweetcorn, herbs and breadcrumbs or maybe chickpeas, think sweecorn falafel. Not bad at all. 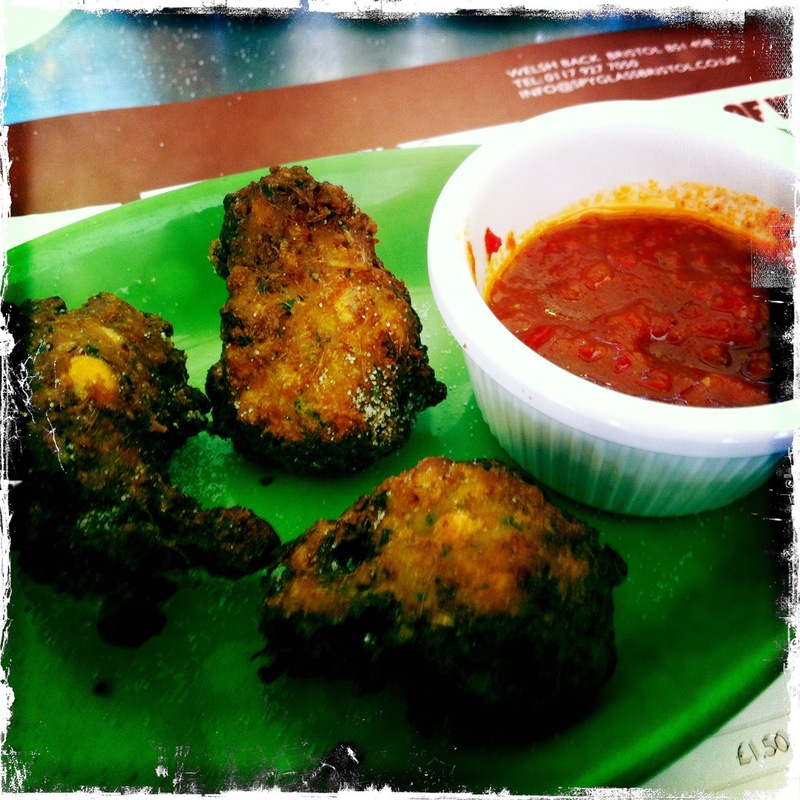 They came served with a really nice chunky chilli sauce which I’m going to try and replicate. It was almost like a sweet chilli salsa. I’ll figure it out and put it up on the blog soon! For my main I had a rump steak. Thought it was a safe bet. Not very impressed. 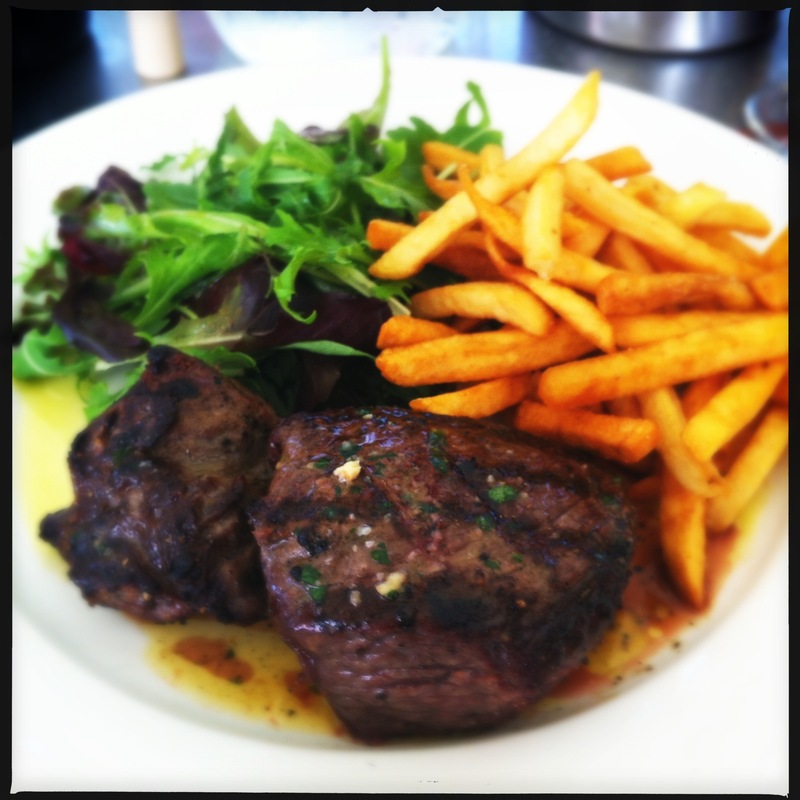 I seemed to get an off cut of two bits of rump which didn’t seem like the best bit of rump in the world really. It was cooked as I wanted so I can’t really mark them down for that but the meat was a bit tough. They make a point on their website that their beef is aged 28 days and bla bla bla which to me would suggest that the beef is going to be really nice and tender but unfortunately it wasn’t. Everyone else who had the steak seemed to get a nicer cut of rump so maybe it was just me. My brother Ben had the ribs which were ok but not amazing and not a large enough portion. Now the main problem here is that he’s always going to compare ribs with the ribs from Hurricanes in Bondi, Sydney. These are easily the best ribs I’ve ever had. Well at least so far. If you’ve ever eaten them you will understand. If you get the full rack they don’t even fit on the plate, the meat just fall off the bone and their bbq sauce is amazing. Damn I could go for some now. Anyway, if you have these to compare to it’s always going to be hard when you have them somewhere else. From the sound of it the Spyglass ribs just done cut it. 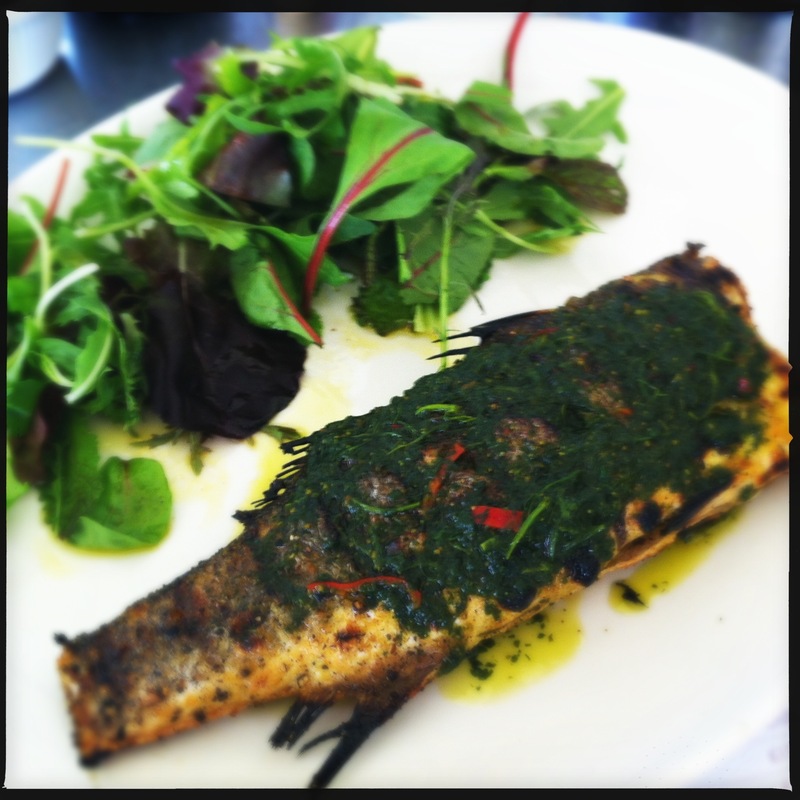 Ben’s friend Angeline had some Seabass cooked with charmoula which is traditionally a North African marinade usually made with herbs and lemon juice and some spices. The fish was cooked well and the charmoula was nice and Angeline seemed happy with it. Generally presentation all round was pretty good. I don’t think this is the kind of place that you really expect to be blown away with presentation but they did it pretty well. It wasn’t just thrown on the plate. The service was pretty good. The guy serving us gave some good advice for the wine and knew what items on the menu were off or had changes to them. After dinner the waiter brought out a banana split with candles in it for my brother and we all sang happy birthday which was nice. We even had round of applause from the table next to us although we went sure if this was just good timing as it was a stag do and they seemed to be clapping at all kinds of stuff. The banana split was well good! All their ice cream is hand made on the premises. The hazelnut ice cream was amazing! All in it was about 25 quid each which wasn’t too bad for a starter a main and some wine. Good location and a nice vibe in the place, the food was average so a timmy rating of 5 out of 10 for the food. As a place to go with some mates for a bit of food and a good night out it was really great so 8 out of 10 for the vibe. Don’t expect to be blown away by the food but for sure save some space for the ice cream. After this we went on a mini pub crawl around Bristol. Things start to get a bit hazy at this point but we did go to a place which tried to tell us that we couldn’t come in as we were a group! hmmm. Angeline who is renowned for being able to talk her way into anywhere began the charm offensive on the bouncers and the rest of us began the piss-taking offensive. All was done in good humour and eventually more because of Angeline than us we got in! I think eventually they just gave up and realised that we were a bunch of middle aged idiots who were going to be as much trouble as a load of old granny’s. I have no idea what this place was called but it was pretty good for a town center drinking establishment. The music went from being pretty good to really bad back to really good again. Even at one point playing some Aim and some Gangstar. After this we went one to a place at the bottom of Gloucester Road called the Full Moon. It’s a really cool place. Great old pub type bar, a great outdoors beach hut style bar in this cool courtyard with plenty of cover for the rain and a lounge dance floor bar the other side of the courtyard. It also acts as a backpacker hotel. Would be a pretty cool place to stay if you’re ever in Bristol. After a few more hours here it was off home in a taxi, completely forgetting to get food I ended up trying to cook potato waffles with cheese. My brother in his drunken state then showed me how you cook waffles in the toaster. Cool. Never knew about this. Pretty simple really. 2. Chuck the grill on high, put the cheese on the waffles and a dash of worcestershire sauce and chuck under the grill for 5 mins. 3. Eat with tomato sauce or whatever you can find in the fridge. I forgot to take a photo until I had almost eaten all of it so it is quite a sad picture but you get the idea! The next morning we went for a fry up to the Fountain Cafe round the corner from my Brother’s place. I had the Special and it was amazing. 2 Bacon, 2 Eggs, 2 Sausage, 2 Hash browns, Beans, Mushrooms, Tomatoes, Toast and a mug of tea! £6.75. Perfect. It’s a very modest, simple cafe that’s clean and friendly, serving cheap not too greasy breakfasts exactly as they are supposed to be served. Service is quick and friendly and the vibe is really great with people in there from all walks of life with one thing in common. 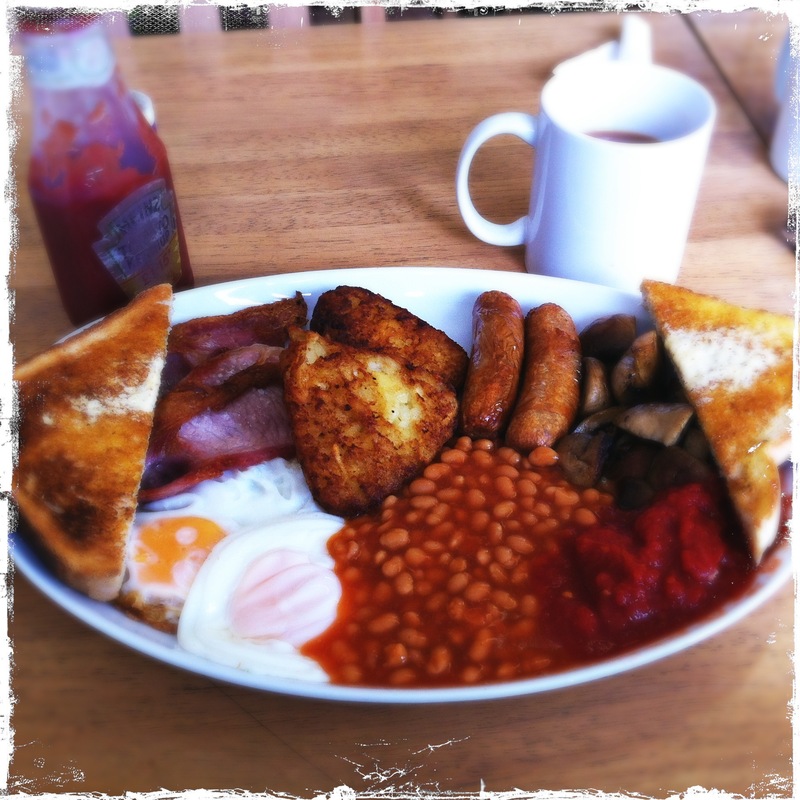 The need for a great English breakfast! Timmy rating 8 out of 10!